This month we are featuring the beautiful 308 gallon SPS reef aquarium of Chadchawin Rueangdech (Last Version). Also check out Reefkeeping Blog! Wow!!! That is gorgeous! Very nice minimalist layout. Congratulation Paul, very special month for you and your son. Last edited by Moddy; 05/04/2011 at 09:23 PM. an amazing tank that deserves the honnor! Thanks all friends, Today i'm very happy. It's an anniversary my son and 5 years of SiamReefClub Thailand and the highest honor that I get from here. It's hard to find one day that will make me happy like this. Well done.... the ultimate acccolade. Last edited by Moser; 05/05/2011 at 02:34 PM. Congratulations! Your tank is just beautiful! In all the full-tank pictures your tank has very good visual balance. I admire very much your mature colonies and how the structure almost seems to float off of the bottom. The arrangement is well concieved to provide a perception of depth with open spaces, and you've made great use of the height of the tank as well. 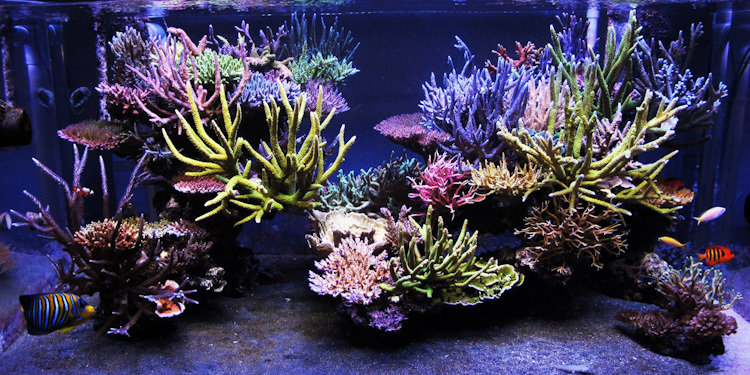 Many tanks look like a managery of coral perched on top of rocks - I know my last tank always left me with that impression. Your tank has an open and light feeling that I would like to achieve next time. An inspiration, thanks for showing it here. do you use natural see water ? Very nice looking tank. Congrats!!! How much time did it take for your coral to have a significant growth? Last month my frag grew...about 2cm under 20k radiums. Yesterday I changed the MH to a 10k since I have been reading that corals grow faster under 10k. What do you say about this? 75g(display), 30g sump, GFO Reactor, SG 1.026, Ca 420, Mag 1350, PO4 0, & 8.0 dKh. Lighting: MH 20000k Radiums & Actinics. Flow: (3) Koralias, 2, 1050, 1400, Seio M820 & a Mag 5 return. Berlin Red Sea(upgrading soon) skimmer with a Rio pump. Absolutely spectacular looking tank. Well done! "When two opposite points of view are expressed with equal intensity, the truth does not necessarily lie exactly halfway between them. It is possible for one side to be simply wrong." Whoa! Gorgeous tank. Nice full grown stags. I'm sure that as you look at those pictures, the coral has since grown. Beautiful tank. I like how organized and simple everything is. Congratulations. Wow! This Says So Much! New SW Tanker! Water clarity is beautiful! I've so much to learn (nearly 3 months in), and cannot say enough of what I have learned off of this Forum from the threads and experienced Reefers. I still don't understand the protein skimmer set-up (do not have one). Fish are OK so far - below is my set-up (probably started too large a tank for a SW Newbie). Suggestions?! Thank you! 90 gallon SW Tank w/crushed coral base. No protein skimmer yet - type? All of the above seem OK and getting along for 2 weeks to 3 months. Did get an attack of Cyno - cleared up. congratulations Chadchawin , really beautifull tank !!!! May the flow be with you ! 272 gallons Mixed Reef. Started on 10th July 2013. 2 x 400W MH. Tunze Turbelle Stream 6105 Controllable. Octopus Diablo DCS-250INT.